Using the clinical note templates for the current location, you can quickly enter clinical notes into a patient's record. On the Patient menu, under Clinical, click (or tap) Chart or Quick Exam. 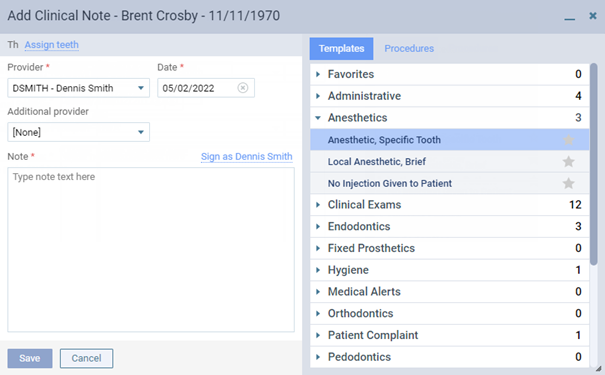 The patient's clinical record opens with the Chart or Quick Exam tab selected. 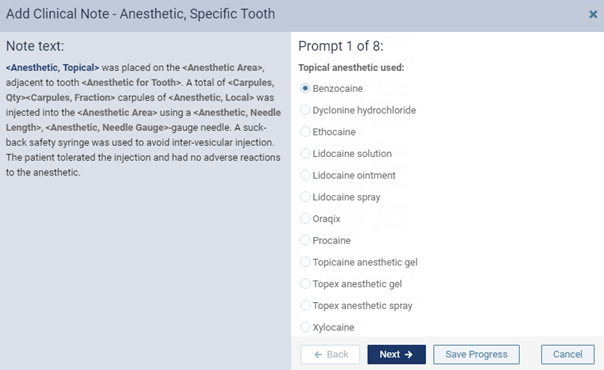 To assign tooth numbers to the clinical note that you are going to create, on the Chart or Quick Exam tab of a patient's clinical record, select one or more teeth. To not assign tooth numbers to the clinical note, skip this step. You can assign tooth numbers and change the assigned tooth numbers as needed later on. On the Chart, Progress Notes, Quick Exam, Treatment Planner, or Perio tab of a patient's clinical record, click (or tap) Add Clinical Note; or if the patient has an existing clinical note, on the Clinical Notes button menu, click (or tap) Add Clinical Note. The Add Clinical Note dialog box appears. On the Templates tab, select a template. Note: A location's clinical note templates are available when entering clinical notes only from that location. However, if a user makes a clinical note template a favorite, it will be available for that user from any location. If there are any quick-picks associated with the selected template, respond to all prompts that may appear, clicking (or tapping) Next between each prompt. On the last prompt, the Next button changes to a Done button. The finished note appears in the Note field. Add more notes, and set up the other options, such as the provider, as needed. Date - The date of the note. Leave the current date, or click (or tap) in the field to select a different date. Additional Provider - The secondary provider to associate this note with. Note - The text of the note. You can type free-form notes. You can also insert another note (where the text cursor is positioned) from a template.